Some prices have doubled, even tripled in a month. Meat is getting scarce because of rural exodus and animal diseases. Premier Wen Jiabao urges action and greater government supervision. Guangzhou (AsiaNews) – Chinese authorities are getting increasingly concerned about rising food prices, especially for pork and rice, and worried about the impact the trend may have on social stability. Mainland media have reported that shortfalls in stock and high feed prices have led to double-digit price rises for meat in several places, including Guangzhou, Shanghai, Beijing, Shenzhen and Shenyang. In Shenzhen the price of pork went from 9 yuan a kilo in April to 28-30 in may and on Sunday a Guangzhou supermarket opened at 8 am sold it at about 16 yuan on a special. The one tonne in stock was sold out in less than an hour with shoppers lined up for more than a kilometre. The price of pork, a key staple in Chinese cuisine, rose across China. According to the Ministry of Agriculture, the price of pork rose 29.3 per cent last month from April last year. Shop owners are concerned that rising meat prices will cause hikes in other food items. Already the price of eggs rose by 30.9 per cent in a year, and rice and grains jumped by 6.1 per cent. The soaring prices are likely to fuel inflation, an issue of deep concern for the authorities. The consumer price index—a key indicator for inflation—rose 3 per cent in April, compared with a 1.5 per cent rise in the same period last year. In its rapid growth in the last decades China did not experience high inflation because of tight controls over agricultural output and stable salaries. However, over time, rural exodus, soil pollution and widespread poverty in the countryside have reduced farm output and animal stocks. Hikes in fertiliser and feed stock prices have made matters worse. Outbreaks of disease among farm animals have accentuated the trend. 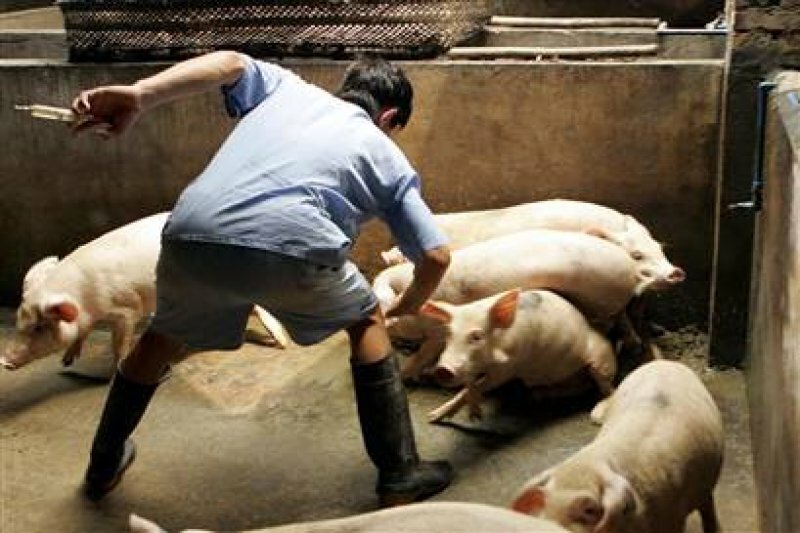 Some scientists have reported millions of pigs dying in the last few months as a result of infections. With inflation rising there are fears that wages will follow. This will likely reduce one of the factors that have given China a competitive advantage, attracting foreign investments, i.e. its cheaper labour force compared to other countries of the region. But the greatest fear is that rising prices might trigger a wave of social unrest. Last week-end Premier Wen Jiabao travelled to Shaanxi province, where he visited pig farmers and markets. He used the occasion to warn officials that price increases would affect the nation's stability. The premier urged government departments to maintain market supply by boosting production, increasing the supply of pig feed, strengthening government supervision over the market and providing financial aid to poor families in an effort to maintain social stability. Hu Xingdou, a political commentator with Beijing University of Technology, noted that soaring food prices and runaway inflation were among the catalysts that set off the 1989 student-led demonstrations in Beijing’s Tiananmen Square.